This list has excellent scopes, ideal for long range hunting and shooting. All these scopes perform well, and have excellent glass and quality. 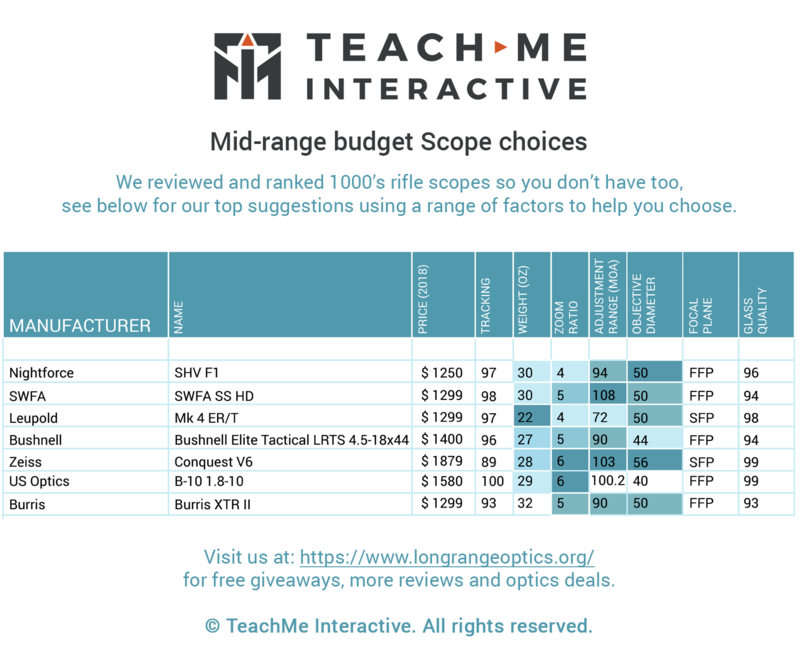 In order to make choices here with such a great group of products, you may wish to check the article “Where are the scopes made or assembled?” in order to help you understand the quality and origin of the scope. Nightforce SHV F1: Shooter, Hunter, Varminter scope is Nightforce’s entry-level scope, spend more and get the FFP version. It has excellent glass, great reticle choices and is ideal for hunting or long range shooting with rock-solid design and manufacturing. While it’s got a lower zoom range, the glass makes up for that loss, and this scope tested out to targets beyond 800 yards with no issues. SWFA SS HD: SWFA Super Sniper High Definition passed the Navy contract for rifle scopes, replacing Leupolds run with the Mk 4 ER/T: that says a lot for the value of this product. It has a great adjustment range and solid feature set with FFP, a good choice in this price range. Leupold Mk 4 ER/T: Gold standard for riflescopes for years but can have mixed turrets/reticle. Leupold is an ironclad name in rifle scopes with a great track record, although the Mark 4 is now very old and likely to be discontinued. It has large turrets and lacks all the features of other modern designs but is a proven product. Bushnell Elite Tactical LRTS 4.5-18x44: Bushnell Tactical Elite cuts down on weight with a smaller objective lens than other long range scopes. Great reticle, glass clarity and tracking for the price. Zeiss Conquest V6: The most popular SFP scope because of glass clarity. Zeiss makes some of the best SFP scopes in the industry, illuminated reticle, the scopes suffer from lack of First Focal Plane. The designs feel more like a consumer camera than a typical high-end scope, that may appeal to some and not others. USO B-10 1.8-10: The perfect scope for the AR. Durable with a great zoom range. Strong tracking and good glass with a great reticle. US Optics are valued by the military for durability and clarity. Non-transferable warranty makes it less desirable than other choices. Burris XTR II: Burris makes a good scope, with a wide choice of reticles, quality constructionand good glass. They offer a First Focal Plane scope at a great price point with a solid warranty and great customer service. This is a very popular and well-liked scope in the community and a great option at the entry level price point.